This data set contains a single text file which reports litter type and mass in the old-growth upland forest at the Pará Western (Santarém) - km 67, Primary Forest Tower Site. 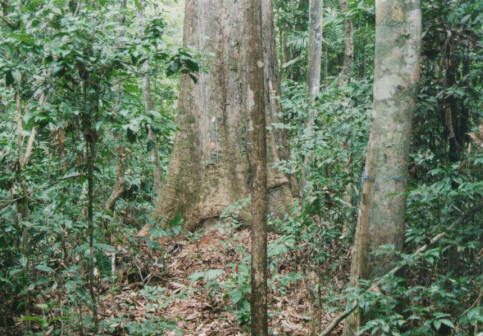 This site is in the Tapajos National Forest located in north central Brazil. Measurements extend from July 2000 through June 2005. Litter collection began in July 2000 using 40 circular, mesh screen traps (0.43 m diameter, 0.156 m2) randomly located throughout the 19.75-ha tree-survey area (Rice et al., 2004). Approximately every 14 days, litter was collected, sorted, oven dried at 60 degrees C, and weighed. The litterfall from each trap was sorted into (1) leaves, (2) fruits and flowers, (3) wood , <2 cm diameter, and (4) miscellaneous. 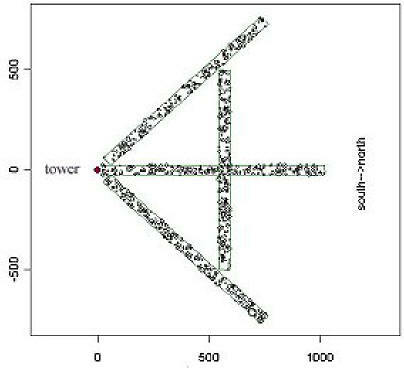 Data values reported are the mean and standard error of the 40 mass measurements of each of the litter components and the combined total, that have been converted to the reporting units of Mg/ha/yr. The litter data are reported in one comma separated ASCII text file, lba_km67_litter_archive.txt. Data values reported are the mean and standard error of the 40 mass measurements of each of the litter components and the combined total, that have been converted to the reporting units of Mg/ha/yr. The data set covers the period 2000/07/14 to 2005/06/11. This is a final data set. Litter collection began in July 2000 using 40 circular, mesh screen traps (0.43 m diameter, 0.15 m2) randomly located throughout the 19.75-ha tree-survey area. Every 2 weeks, litter was collected, sorted, oven dried at 60 degrees C, and weighed. The litterfall sample from each trap was sorted into (1) leaves, (2) fruits and flowers, (3) wood <2 cm diameter, and (4) miscellaneous. The data archived extend from July 14, 2000 through June 2005. Four permanent 50 x 1000 m transects were installed adjacent to the eddy-covariance tower in July of 1999 (Fig. 1), accounting for 19.75 ha of surveyed forest. Three transects originate near the tower and run in the predominant wind directions from the tower (northeast, east, and southeast), while the fourth runs north–south, intersecting the east transect at 550 m. The long, continuous transects aim to incorporate spatial heterogeneity throughout the tower footprint, avoiding bias associated with small scattered plots that can be disproportionately influenced by emergent trees. Rice, A.H., Hammond, E.P., Saleska, S.R., Hutyra, L., Palace, M., Keller, M., de Carmargo, P.B., Portilho, K., Marques, D., Wofsy, S.C., Carbon Balance and Vegetation Dynamics in an old-growth Amazonian Forest, Ecological Applications, 14 (4), s55-s71, 2004.